Mersen GDG Series Non-rejection miniature time delay fuse has an interrupt rating of 100-Amps at 250-Volts AC, a voltage rating of 250-Volts AC and current rating of 10-Amps. 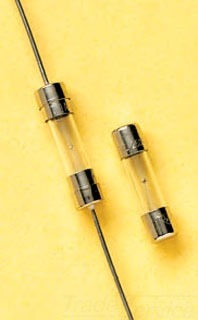 The fuse features cylindrical glass body and ferrule terminal connection. Nickel plated brass contact of this midget class fuse ensures better electrical conductivity and supports clip mounting. It is suitable for electronic circuits. The fuse meets UL, CSA, SEMKO, BSI and VDE and IEC 127-2 standards.